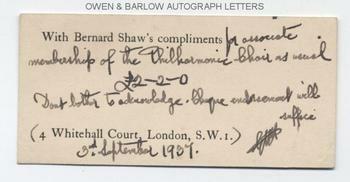 GEORGE BERNARD SHAW autograph Note Signed. ANS. On Shaw's compliments card. 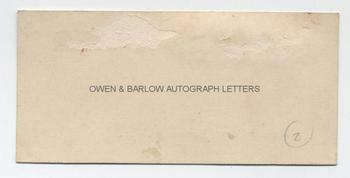 Printed with his address 4 Whitehall Court, London, SW1 and the words 'with Bernard Shaw's compliments'. Dated in his hand 3rd September 1937. To the printed text he has added "For associate membership of the Philharmonic Choir as usual £2-2-0. Don't bother to acknowledge, cheque endorsement will suffice." Signed with initials. Card measures approx. 4.5 x 2.25 inches (11.5 x 5.5 cms). Slight mounting damage to verso, else in fine condition. George Bernard Shaw was a keen observer of all kinds of music and had a particular fondness for choral music, of which he was frequently a scathing critic. The Philharmonic Choir was part of the Philharmonic Society which, in its heyday was a pillar of the musical productions given at St James's Hall, London to which George Bernard Shaw was a frequent visitor.